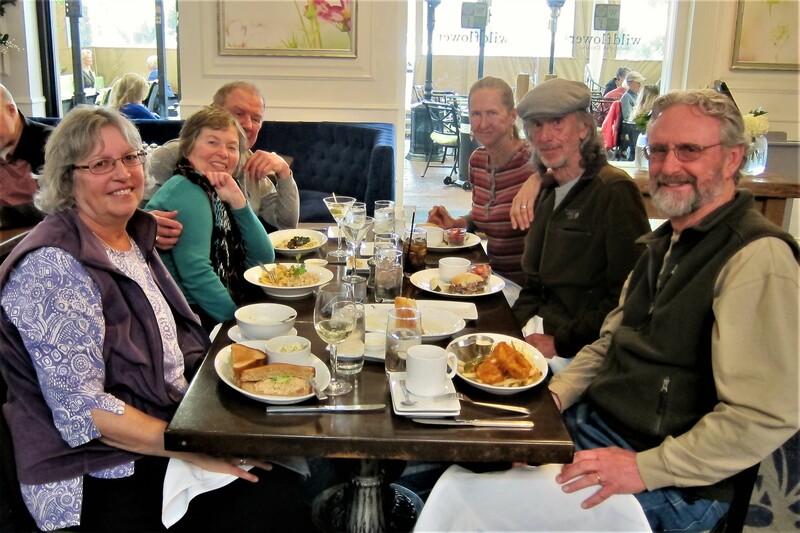 Saturday, January 14 through Tuesday, January 24, 2017-Tucson, Arizona-Phase #2: Kit and I had so much fun spending time with family and seeing the sights in and around Tucson that it took two editions of the journal to adequately cover it all! 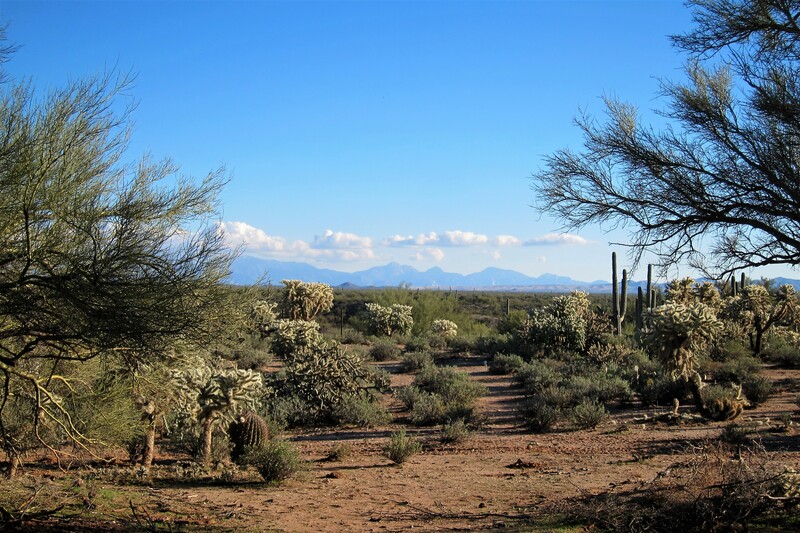 Tucson, a city of 520,000 folks inhabiting 236 square miles, sits at an elevation of 2,389 feet. 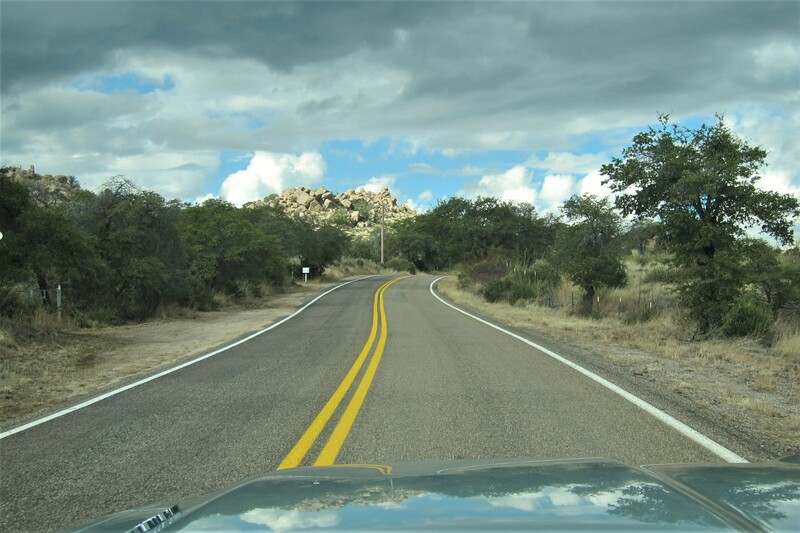 The cities name comes from the Tohono O’odham people and means “sits at the base of a black mountain” …can you tell why? 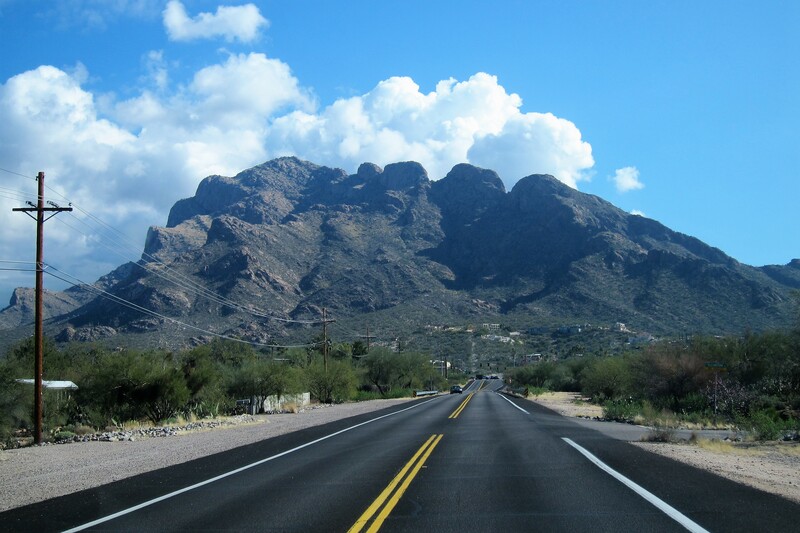 In fact, Tucson is surrounded by majestic peaks, some of which exceed 9,000 feet in elevation and remain snowcapped for much of the winter. There are five official seasons in this part of the American Southwest. The four we are all familiar with, and the fifth known as the North American Monsoon Season…the intense rainy period in mid-summer that dumps 11 inches on the city in a relative short period of time. Since the “monsoon’s” only last a few weeks, the city’s streets are built to double as drainage conduits leading to the various wash’s, which are normally dry river beds. The frequently flooded streets, then leads to rainwater pooling in low lying underpasses before draining into the wash’s. At these times, the affected street is barricaded and motorist are encouraged to detour. However, every year there are a handful of knuckleheads that drive around the barriers and try to ford the pond, and then become stuck. Recently a traffic ordnance was put into place called “The Stupid Motorist Law”…yep, it’s actually called that! Under this municipal ordinance, if you get stuck due to your own negligence, you pay for the rescue…up to $2,000.00! 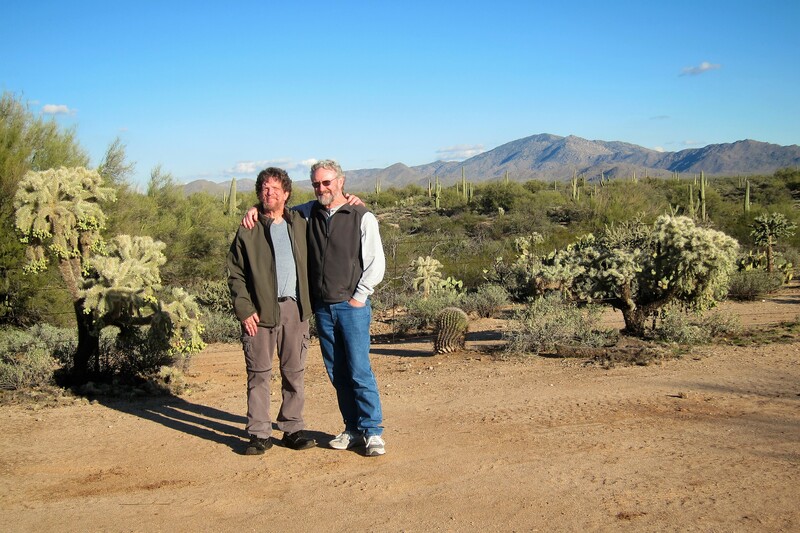 Kit and I love Tucson…so much so that it has become our de facto winter home! However, as nice as this area is, the best part are these folks! Hosting Kit and I for these couple of weeks are Dewey, Bea, and brother Dan, who celebrated his 53rd birthday during our stay. Dan’s special day started with a nice breakfast followed by playing with some of his cool toys! 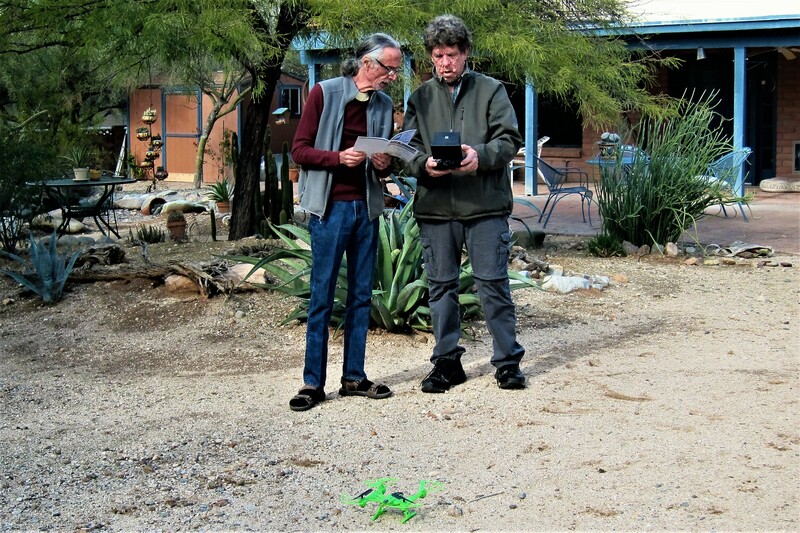 We all had a go at trying to make the quadcopter drone maneuver about the tree and cactus strewn backyard…some with more success than others! Dan actually has three drones, and one of them was advertised as “indestructible”. Well, we took that claim as a challenge…the drone and a half dozen cacti will never be the same again! After a fun filled day, the family retired to a nice Mexican restaurant down in the city where we sipped Margaritas while deciding what to order. As usual, I was snapping photos of the interior décor and the folks at our table. Soon a young Hispanic fellow walked up and offered to take a group photo of us enjoying the evening. After squeezing off a couple of shots, he quickly turned and bolted out a side door…WHAT THE????!!!! We all sat in stunned silence, while I internally stressed over losing dozens of photos stored on the camera. Within a few seconds, he reappeared with a huge grin on his face, saying “gotcha”! I had to turn the camera on him to document the perpetrator of one of the most unique restaurants pranks I had ever seen. Turns out he was a member of the family that owned the place, an accomplished musician, and an unabashed player of practical jokes! 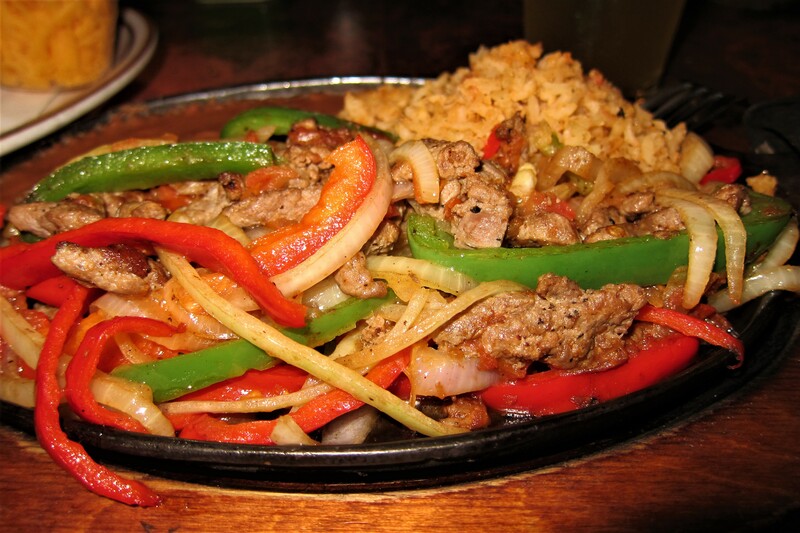 Everyone’s food was fabulous…I had the Steak Fajitas which were excellent. I also enjoyed a second Cadillac Margarita, my new favorite style with Grand Marnier, which was also very good. Hey, don’t judge me…I needed it and after that prank, and I’m not driving! On another day, returning from taking care of some family business, Dewey, Dan and I detoured to a plant nursery. 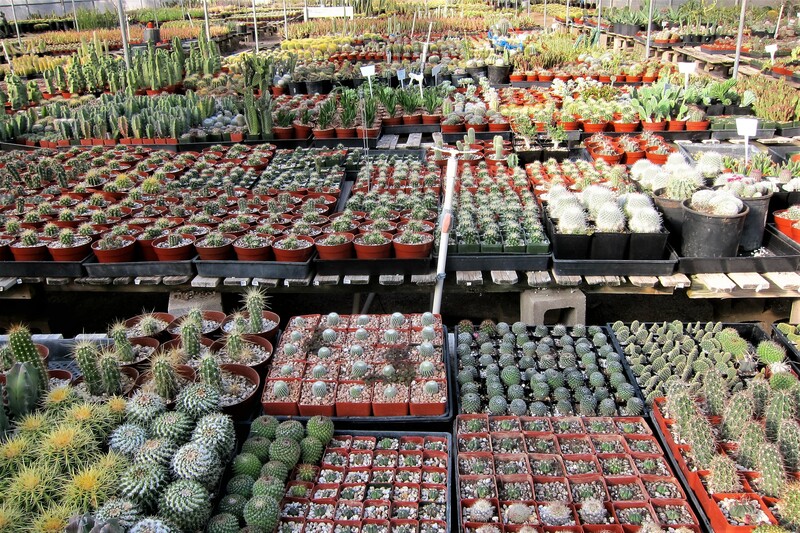 Or as they are known in Tucson, Cactus Farm’s. Many species and sizes available for adoption. 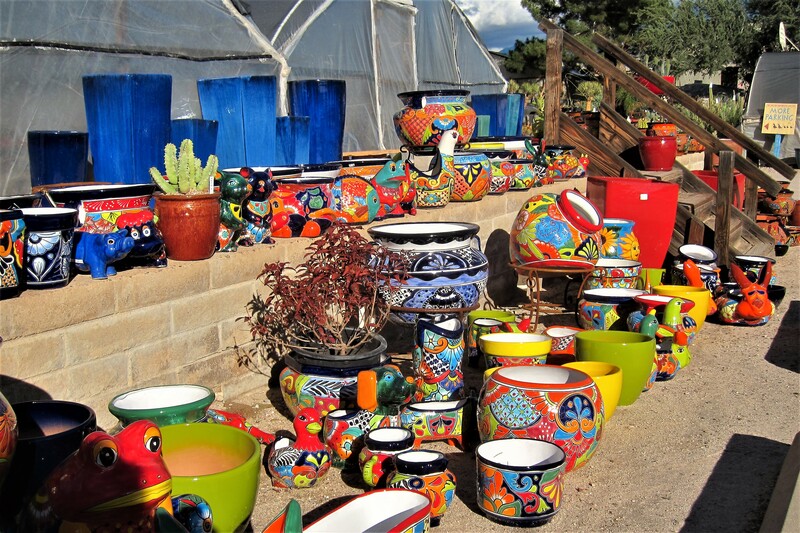 Also, a variety of colorful containers for sale in order to, very carefully, repot your new friend. 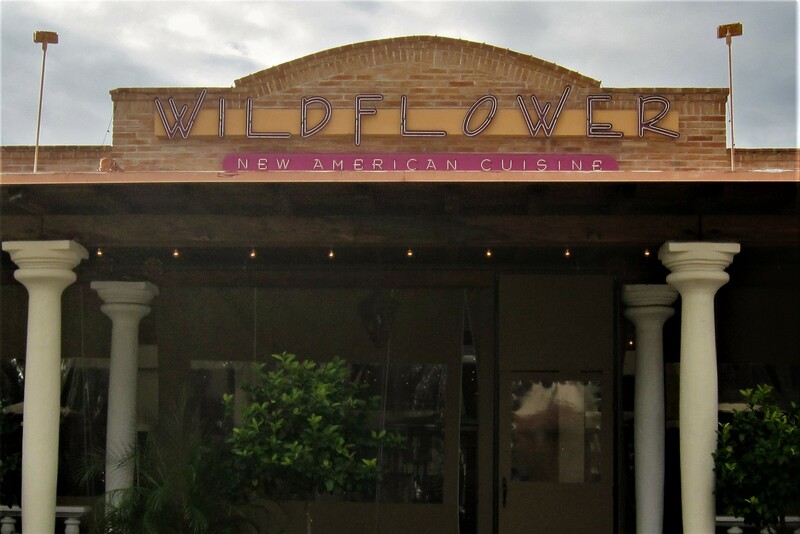 The establishment even features the famous “Southwestern Foamcupabilious” cactus….which only blooms during periods of cold weather. 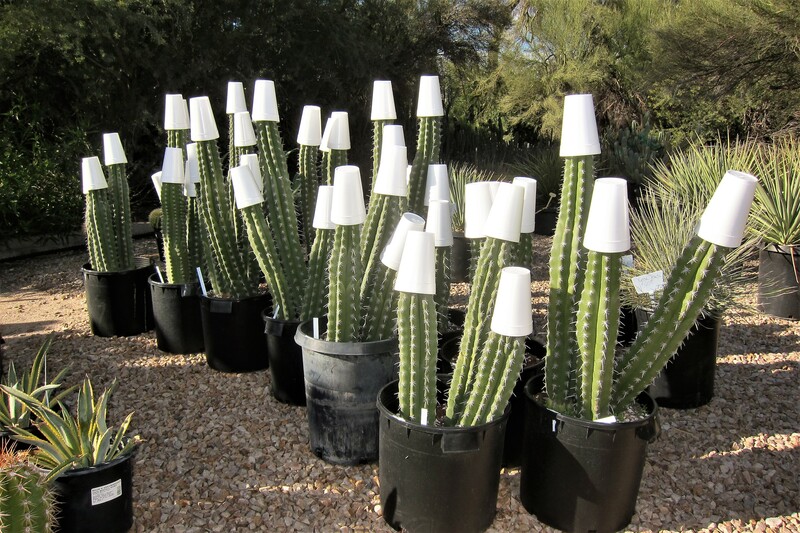 This regionally unique practice of cold sensitive plant protection is prevalent throughout the area whenever overnight temperatures are predicted to fall below the freezing mark…cheap and effective protection for some very expensive cacti. 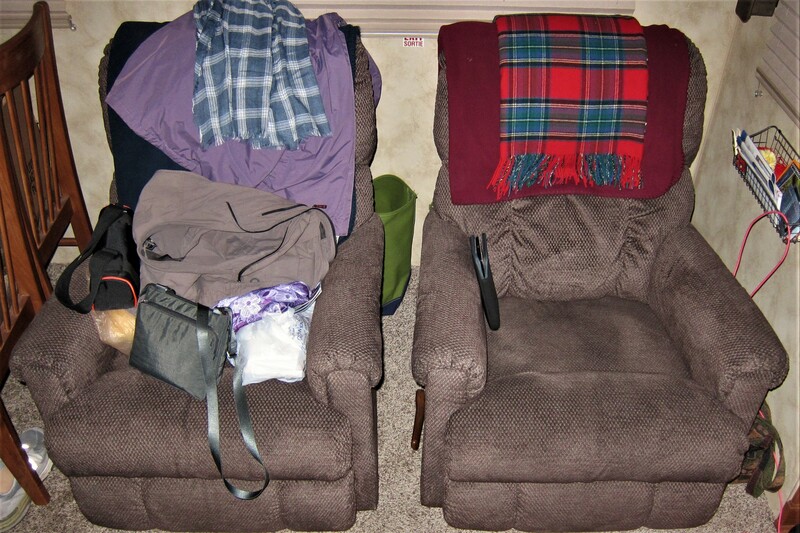 Last year, Kit and I decided to give up on trying to make the lounge chairs that came with the camper more comfortable…so we splurged on two Lazy Boy brand recliners. One for Kit, and one for Kit’s stuff…as for me, I have to make do with an upturned milk crate in the corner. 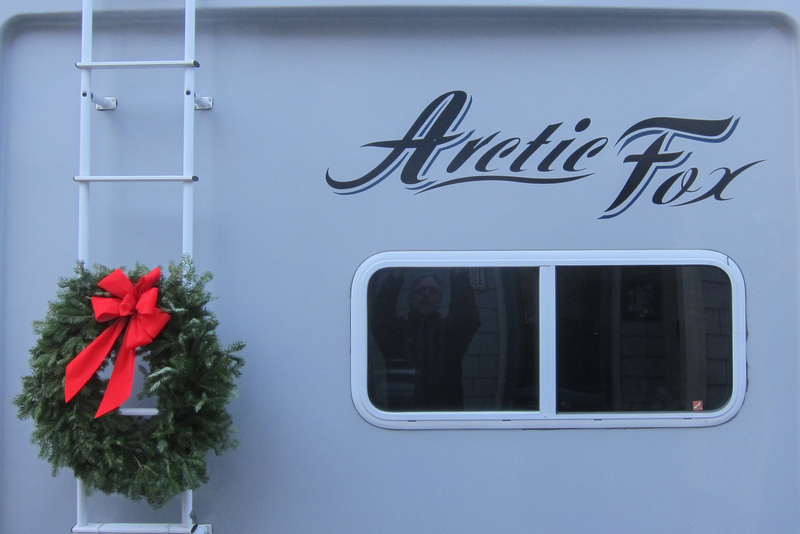 As has been our tradition, we leave Maine in the dead of winter with a native Christmas wreath zip tied to the back of our camper. 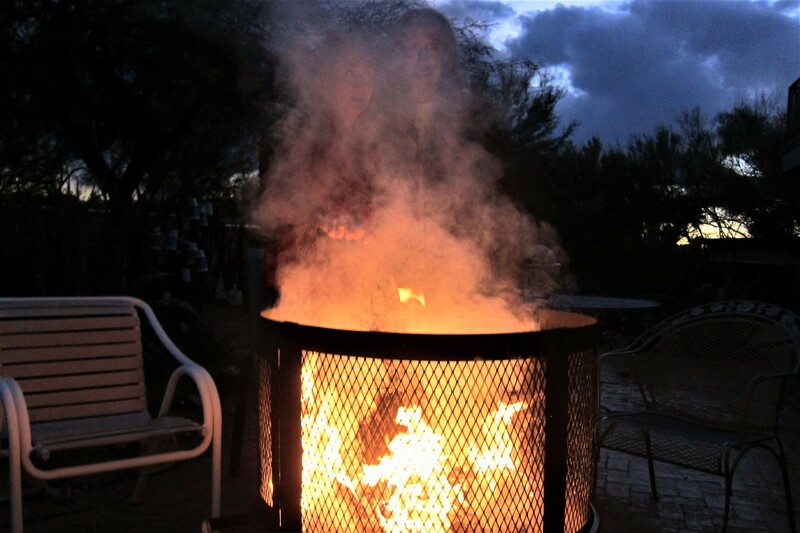 Then, after some time in the Desert Southwest, it dries to the point of spontaneous combustion, so must be removed. 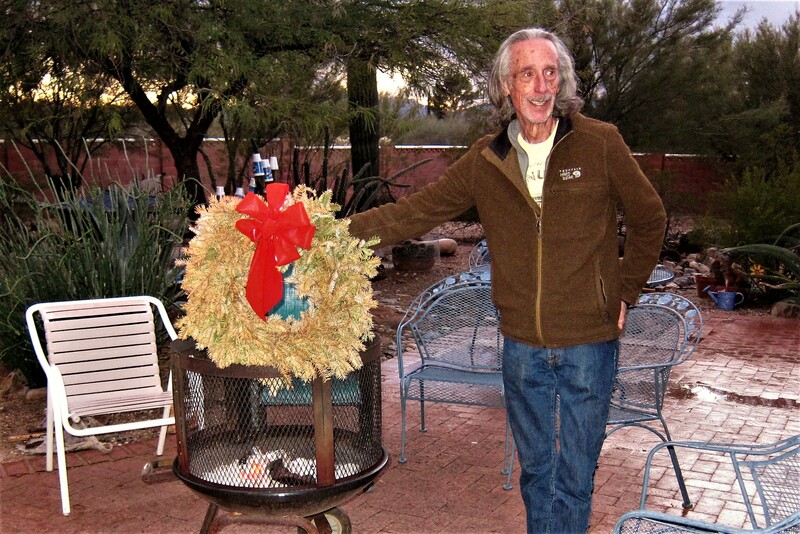 It has been a tradition to ceremonially burn the wreath in Dew and Bea’s backyard fire pit. 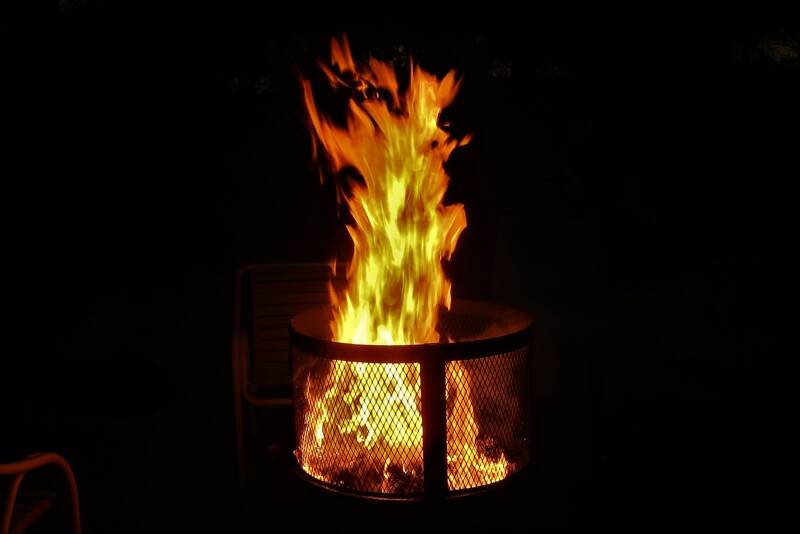 Where it erupts in a flash of flame and sparks which summons the native spirit of the Doobie’s, whose image appears in the smoke above the burning Maine wreath. Yea, I know, I have a rather weird mind…but that photo above was kinda bizarre! I didn’t realize that Dew and Bea, affectionately known as “Doobie”, who were standing on the far side of the fire, would show through the thick smoke and appear as a ghostly image. It was only after downloading the photos on my laptop did I see their expressive faces, so I just had to weave this photographic phenomenon into the story somehow! On one of brother Dan’s rare day’s off, he and I set out for an adventure of our own. We drove up to his childhood hometown of Oracle, 26 miles to the north. Oracle, a small town of 3,686 souls inhabiting 16 square miles, sits at an elevation of 4,524 feet. The town was settled by an early miner that had travelled to California in 1870 on a ship named Oracle…which was built at a Maine shipyard! 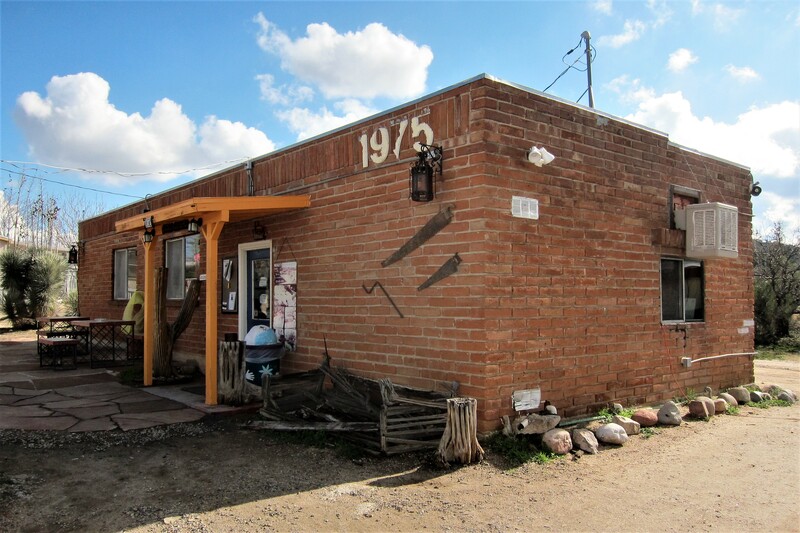 He later traveled to the Arizona Territory and filed a mining claim which he named after the ship that had brought him to this rugged and remote area of the country. We have some family property up here so it’s been a tradition to drive up to see how it’s fairing, poke around the village a bit, and grab some fine Mexican food at one of the local dive’s. Casa River Café is as small as it looks, and half the interior space is taken up with kitchen! However, the food was plentiful, inexpensive and delicious! 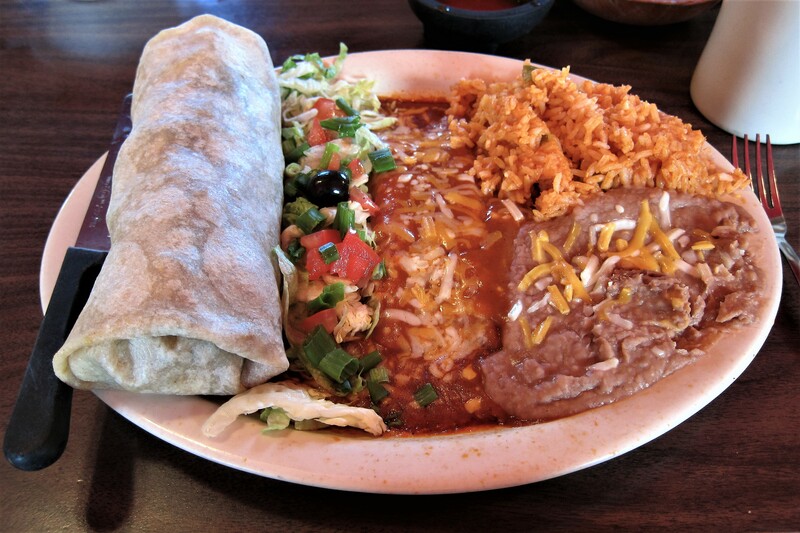 Can’t beat authentic Mexican food cooked by authentic Mexicans, using authentic Mexican ingredients! After lunch, Dan wanted to explore some of the countryside of his youth, so we lit out on the old Willow Springs Road heading toward the Western mountains. For miles and miles, we were the only inhabitants on this dusty and winding road, until we came around a bend and spied this fellow. He gave us the old “stinkeye” so I brought the truck to a screeching halt. 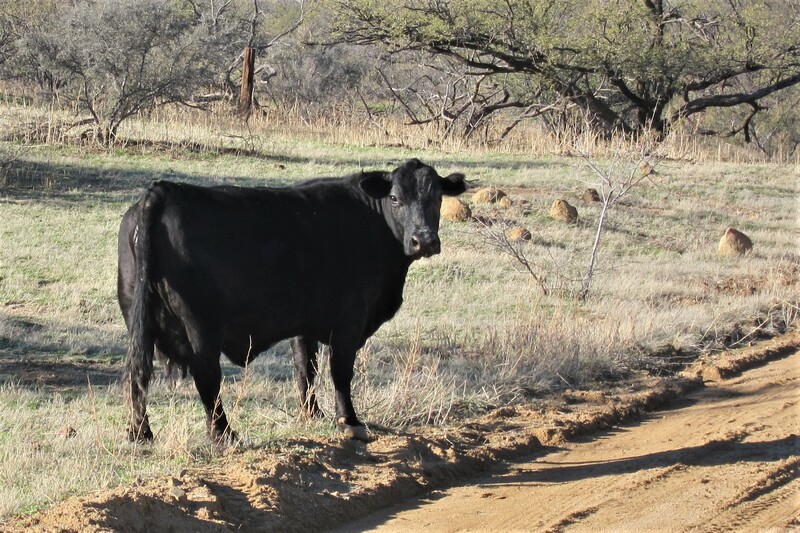 Not sure if he was going to cross in front of our path, but I did not want to take any chances…could have been a bad day for us, as well as the male bovine, and we are not within cell phone range! 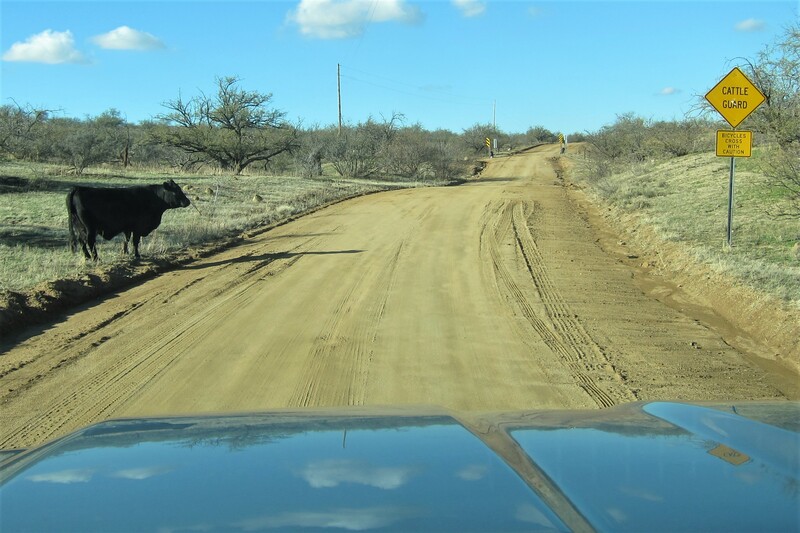 Then I noticed the sign indicating he was the “Cattle Guard”…but, we didn’t see a badge or weapon, so believe it was just a bunch of bull (pun intended)! 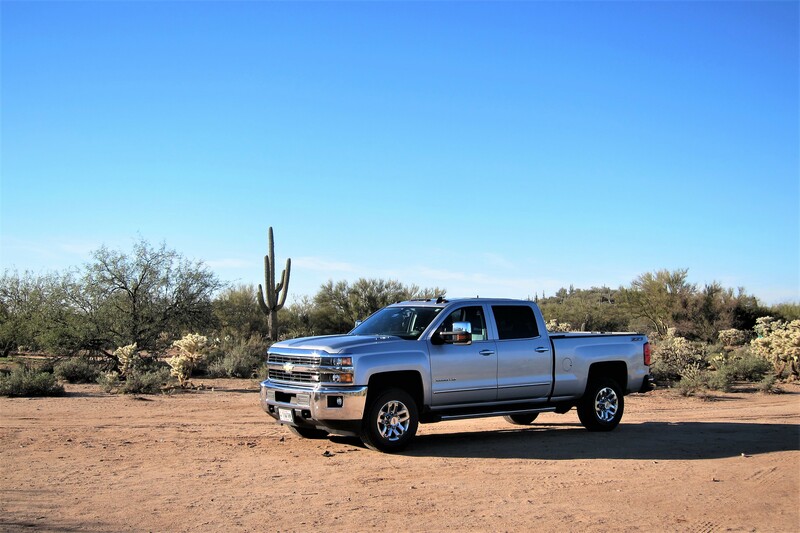 After about an hour, Dan and I “had to take a break” so I pulled into an open field, where the truck posed for a classic “Southwestern Cowboy Cadillac” photo. And we poked around the scrub brush and cactus to find any artifacts from days gone by. However, much to our chagrin, it doesn’t appear that Mister Artie Facts ever set foot on this beautiful but desolate land. A great day spent with a wonderful young man in an area of the country few tourist take time to explore. Thanks for spending the day with me brother…love you! 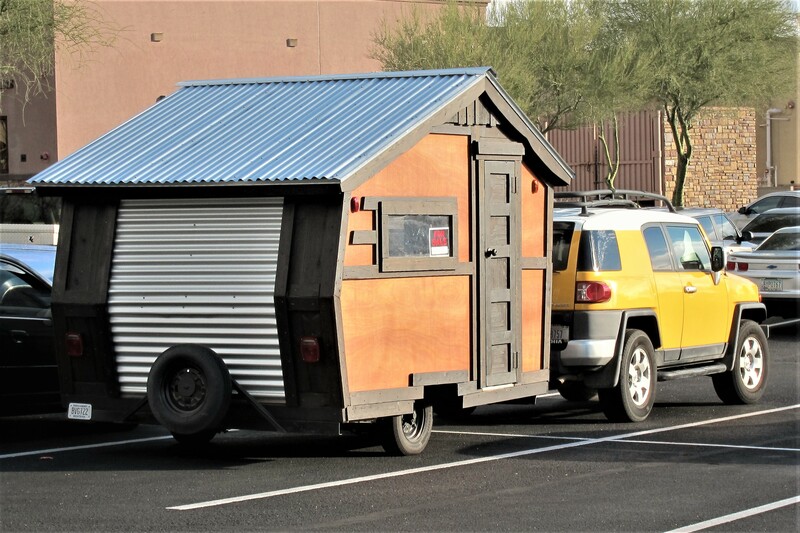 On another day, while Kit and I were out running errands, I spotted this unique homemade tiny home on wheels. The rear looked to be a rollup door and the whole thing couldn’t have been longer than fifteen feet, and it’s for sale if anyone is interested?! Wanted to see inside, but the owner wasn’t anywhere to be found. Dewey and Bea have an active social life, that is until we show up. However, against their better judgement I’m sure, they invited us to a nice restaurant to meet some of their friends, George and Diane. 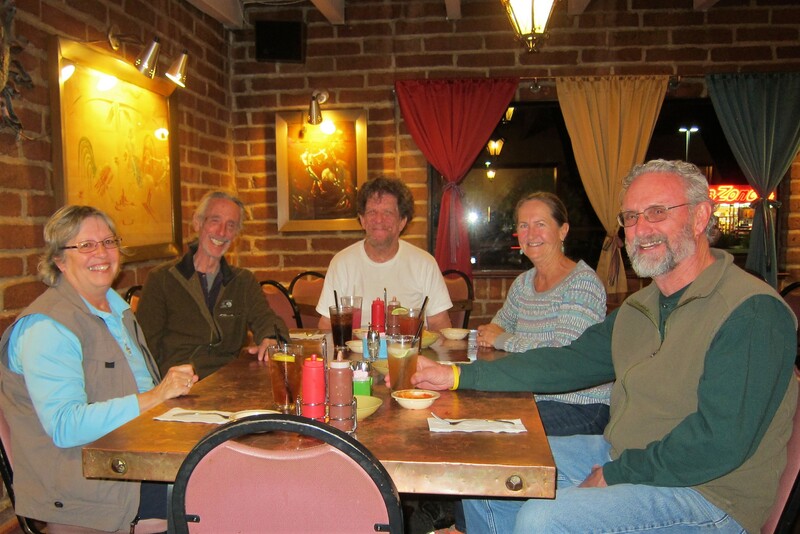 We enjoyed a great meal and lively conversation…and I was very careful to not embarrass anyone! Well, we reluctantly need to move on and continue our westerly trek…some folks can drive from Maine to San Diego in about five days, it takes us over two months! But before we depart Kit and I wish to thank these two wonderful people for their hospitality and generosity with their time. Hope to see you on the road at some point this winter, but until then, stay safe and keep smiling…love you guys!! 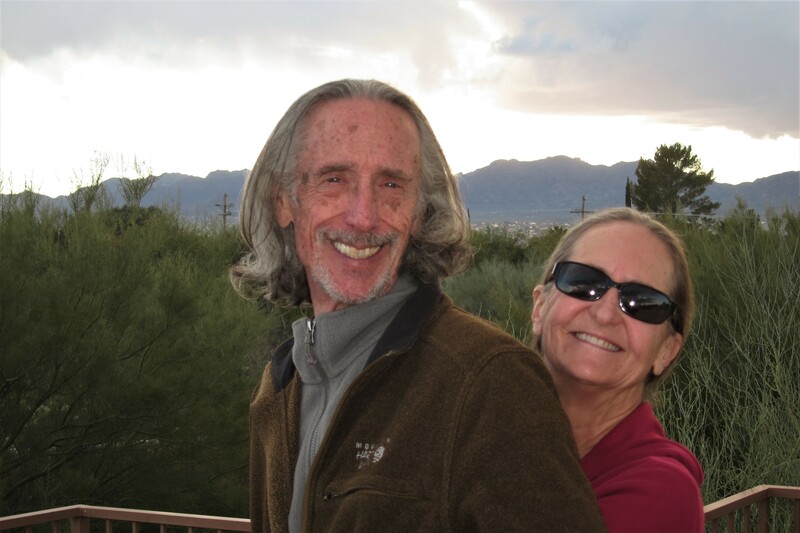 …Kit and I lament the end of our Tucson Adventure and bid you all a goodnight! 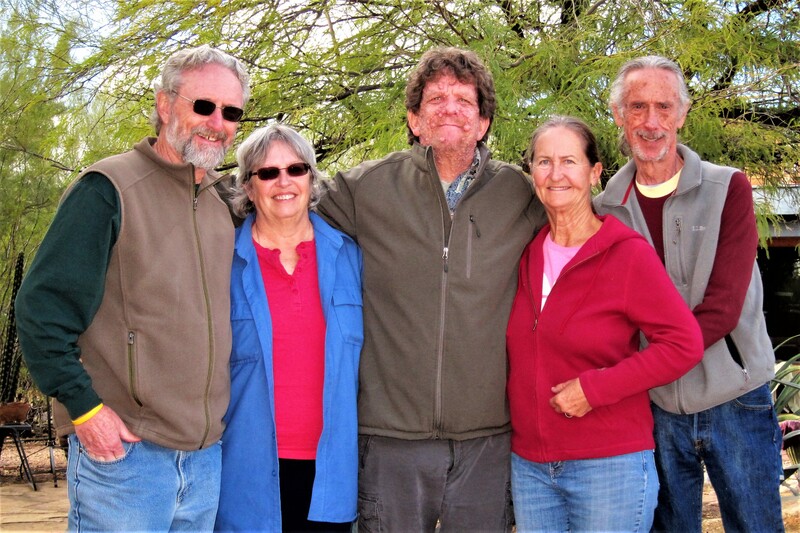 Kit’s Bit’s: We thoroughly enjoyed our stay in Tucson with Dewey & Bea, as always. They are such gracious hosts, we never feel as if we’re in the way. Nice that we have our own “space” and they, of course, have theirs. Some days, they’re busy with daily activities and we have things to tend to, as well. It’s almost as if we’re “neighbors”. Thanks, Dewey & Bea for having us, we so appreciate our stay with you folks. Ah, yes, the 5th season of the SW…I always liked them. 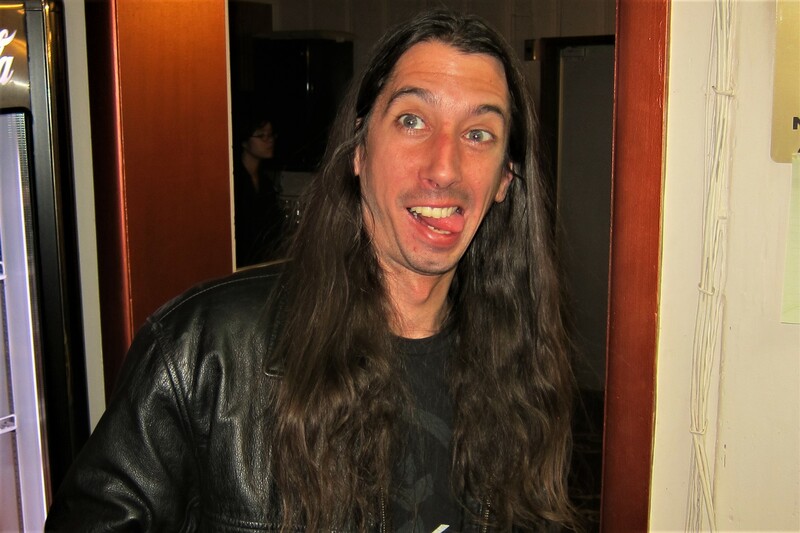 OMG…that server who took off with your camera has quite the sense of humor. Good thing he knows the owner well. 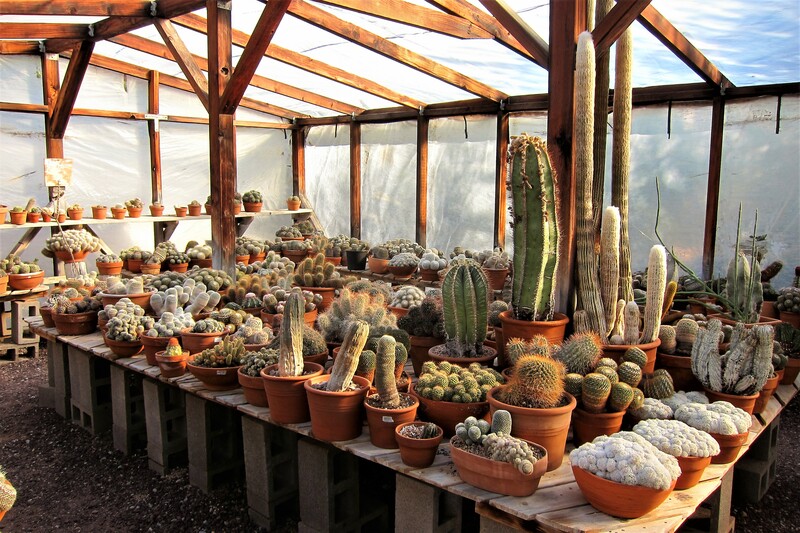 ….The cactus farm looked very interesting. Beautiful! ,.. Great idea of having a ceremonial wreath burn. It looked rather crispy even before the burn.. I must say the spirit of Doobie’s gave me a little chill! ….I absolutely love the story about how Oracle got its name and the connection to Maine. I went through there many years ago. 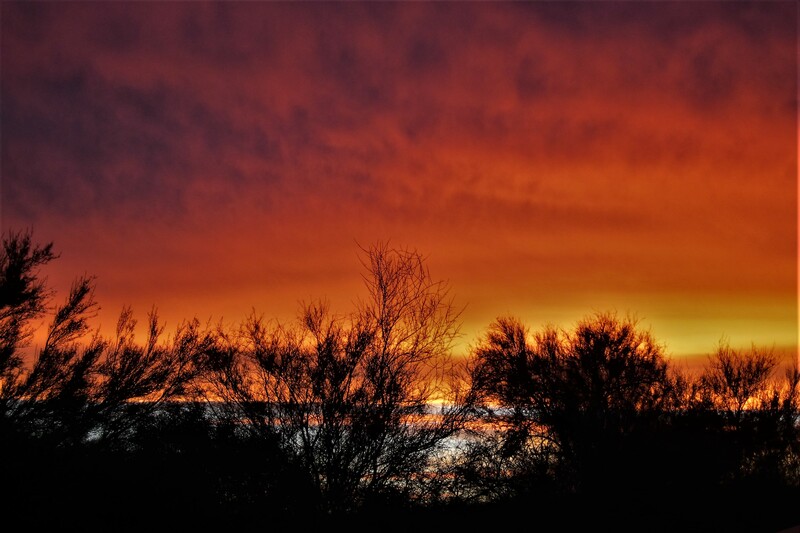 … You managed to capture another incredible SW sunset! Absolutely gorgeous. Will look great in that book you are destined to write my friend…. Thanks for your very kind and inspirational comments! At some point I wouldn’t mind taking a photography class to raise my photos up from the “snapshot quality” category…actually, a creative writing course wouldn’t do any harm either! Take care, miss you and all our SD friends! We sure could use some of those beautiful brightly clay pots on the sun deck!! Sure nice that you have a chance to spend quality time with family and friends each winter. 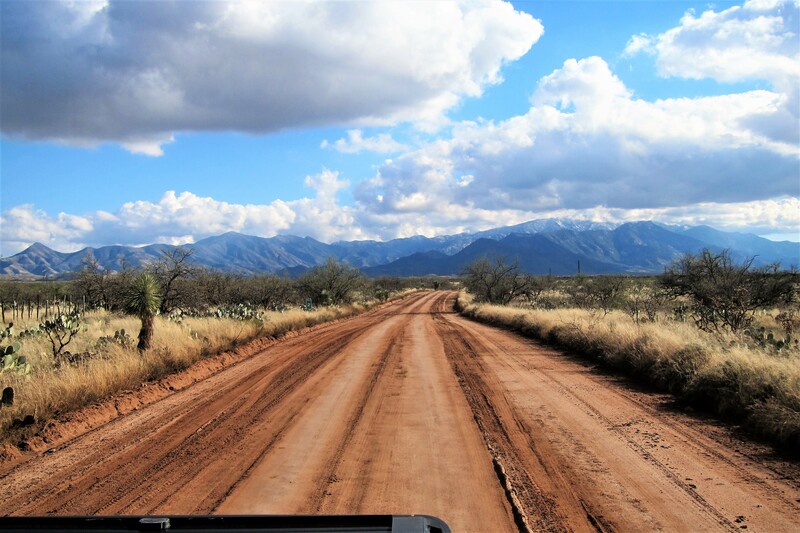 It was nice, now we are on the road once again…as are the Tucson arm of the family! And thank you for the nice comment…take care of yourself, hope to see you this summer upta Maine! Well I know what would happen to me if I ate that much delectable Mexican food! Ha, ha….love Arizona, which I had gone there more when in San Diego. The weather certainly beats what we’re having. Single digits and snow, snow, snow! Big nor’easter blowing in tomorrow and Monday. Helped a buddy move from the very rich town of Brunswick to the east side of Portland. 500,000 condo with view of the bay. Didn’t know Portland even had nice homes like that. Keep rolling and be safe you two! Love ya both! Hey folks, thanks for staying in touch. Spring must be just around the corner…hang in there! Love you guys as well! Enjoyed your blog, as always, Bill! Curious though, when you first arrived in Tucson, AZ at Dewey, Bea and Dan’s birthday dinner, you show “a nice Mexican restaurant down in the city where we sipped margaritas while …” I don’t SEE any margaritas on that table, bud! Just beer and soda! GOTCHA on the details! Me thinks you discovered “Cadillac Margaritas” elsewhere! Really? Your first taste of a Cadillac Margarita, my favorite bar drink? So very common in California. Watch out for them though – they do go down very smoothly due to the Grand Marnier liqueur but can pack quite a punch. Safe travels, my friends! Hope to see you in NorCal on your way to visit the Oregon/WA state coastline! The shape of the glass might have thrown you off, it has been our experience that most Mexican Restaurants along the Southwestern border and in Mexico use this style of glass…the stemware that looks like an upturned Sombrero and frequently has a Saguaro molded into the stem is a gringo invention developed by the Libby Glass Company in 1957. If we get anywhere you folks on this trip, we will certainly stop by for a visit! Oh ok! My mistake! Sure looked like glasses of beer! Looks like those glasses would hold twice what Libby glasses would hold. Mexican restaurants in NorCal don’t use Libby glasses. They use large or tall, clear glasses. To my mind, BEER belongs in the colored glasses I saw in your photo!